Does someone you care about smoke? It can be hard for them to quit smoking. But you can make a difference. This section gives lots of ideas for helping a smoker quit. Click the 4 Steps to Helping. 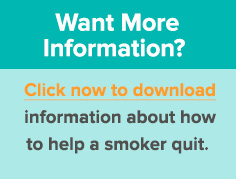 Check out Why It’s Hard to Quit Smoking for information to best support the smoker in your life. How to Help People Quit Smoking is full of ideas on things you can do to be most helpful. Seeing Eye to Eye gives three important questions to ask the smoker in your life. Tips for Helping offers more specific ways to show support. And the best of these tips? No nagging required! Read about approved Quitting Aids designed to help smokers quit. Get ready for When It Gets Tough. To learn a few things about quitting smoking that don’t always get talked about, look over What You Won’t Read Anywhere Else. Yes, quitting smoking can be hard. But you can make a difference. Congratulations for taking this step to help!